When Odilia and her four sisters find a dead body in the swimming hole, they embark on a hero's journey to return the dead man to his family in Mexico. But returning home to Texas turns into an odyssey that would rival Homer s original tale. With the supernatural aid of ghostly La Llorona via a magical earring, Odilia and her little sisters travel a road of tribulation to their long-lost grandmother s house. Along the way, they must outsmart a witch and her Evil Trinity: a wily warlock, a coven of vicious half-human barn owls, and a bloodthirsty livestock-hunting chupacabras. Can these fantastic trials prepare Odilia and her sisters for what happens when they face their final test, returning home to the real world, where goddesses and ghosts can no longer help them? 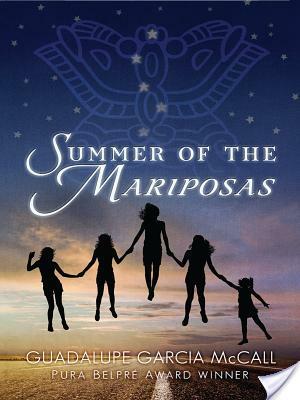 Summer of the Mariposas is not just a magical Mexican American retelling of The Odyssey, it is a celebration of sisterhood and maternal love. I think my favorite Odyssey retelling of all time is the movie�O Brother Where Art Thou. It’s such a creative, fun, musically interesting retelling. As I love that movie so much, I look at other retellings of the Odyssey with a view of optimism. After�The Summer Of The Mariposas by Guadalupe Garcia McCall passed my threshold, I looked at it with optimism, but not much motivation. Friends, this book sat on my Kindle and then in my house for YEARS because I can sometimes be a terrible blogger. I decided to make McCall’s contemporary-fantasy retelling a summer priority in order to kill two birds with one stone — read an old book from my TBR pile and thus be able to pass it on and also to remove a Netgalley book from my queue. Also, because The Odyssey is mad awesome. Odilla and her four sisters plan on spending most of their summer swimming at the watering hole and having a grand old time�seeing as how it’s a summer without adult supervision. Their mother is spending all of her time working because she’s a single mom at this point. Their father has seemingly abandoned them, because he is terrible and arrogant and it’s been like a year since he’s contacted them. So anyways, the girls are all, let’s go swimming when they stumble across a dead body in the water! They fish the body out and come to the consensus that they have to take the body back to Mexico to the family of the man. They also decide to stop at their paternal grandmother’s home as well. The journey to Mexico is fraught with danger and monsters, however the girls are not without a guide — La Llorona, who is not exactly the most traditional of spirit guides, given that she’s allegedly a villain and such.�The Summer Of The Mariposas weaves together Aztec folklore and the Odyssey and Mexican folklore. It’s a really neat story. I’ll be honest here and say that I really liked the story of sisterhood and five girls together against the world. HOWEVER. Sometimes the girls would be so annoying. This is where my rating comes into play. I think that I would have liked�Guadalupe Garcia McCall’s book a bit more if I had been younger. I am 27 and reading this and thinking OMG CHILDREN WOULD YOU JUST LISTEN TO YOUR OLDER SISTER. Because of course, the oldest sister, Odilla was right about everything and listening to her would have prevented some of the scrapes that the girls get into. I guess, that would make for a boring story but it still drove me nuts. The youngest sister,�Pita, was super annoying and should have been eaten by monsters. However, I ultimately liked the portrayal of sisterhood despite my disdain for Pita and the fact that she never listened and was always crying or tattling. This book feels a bit younger than what I am typically into, but I think that it’ll work for people who are actually legitimately teenagers. I mean, I just could not turn my inner-adult off. I think that people who aren’t adults will not have to worry about that issue.�The Summer Of The Mariposas by Guadalupe Garcia McCall is definitely well-written and totally worth reading for the difficulties of sisterhood and the really cool Aztec mythology — there’s a chupacabra which basically brings all kinds of awesome points to the book. I would definitely recommend it to actual young adults.